So although my last post talked about how to deal with Issues of T2 relaxation, it did not really go too in depth into what T2 relaxation is and why we might even want to be aware of it. Mostly because I assumed readers of this blog would already know about relaxation. However, given that part of the purpose of this blog is education, and to be an archive for answers to questions I invariably get asked by students, I thought a post that goes into a bit more detail about relaxation properties as they pertain to spectroscopy might be useful. Plus even those of us who should know better can get caught out when we neglect or forget about the effects of relaxation on our MRS data and results. (I know I have). I’ll also confess I have been thinking about relaxation in MRS and what it may tell us about the cellular environment a lot lately, but more on that later. First of, what do I mean by relaxation? I am of course referring to two properties of the magnetic resonance phenomenon that are witnessed through their effects on the signal received. These are T1 and T2. Let’s start with empirical definitions, that way we can see what the effects are before we talk about how they occur. This will also help us to address the issues they raise for MRS spectroscopy analysis and interpretation. To do this I will assume that you know the basics of MR, namely the separation into high and low energy states, precession and resonance (the larmor equation), excitation and the longitudinal and transverse planes. T1 relaxation refers to the process by which the magnetisation returns to equilibrium after an excitation pulse. At equilibrium, we have an excess of protons aligned with the magnetic field, this creates a magnetic moment, which we call “longitudinal magnetisation”. Longitudinal magnetisation is important, as the amount of signal we can detect after an excitation pulse is directly related to the size of the longitudinal magnetisation, and can not be greater then the longitudinal magnetisation. As the spins of interest (protons, 13C, 31P, any MR detectable species really) are excited by an RF pulse at the frequency of precession, this will allow a change in energy state, with spins moving from a lower energy state to a higher one. (Note, spins in the higher energy state can also exchange the other way, but what we tend to detect is a change away from equilibrium, with less and less spins in the lower energy state, which results in a reduction in the excess magnetisation.) Thinking about exchange between upper and lower energy states for multiple spins can get unwieldy when the numbers get up to those involved in most MRS experiments, so instead physicists often tend to discuss the magnetisation as a simple vector (or as a tiny bar magnet). At equilibrium this vector (tiny bar magnet) is aligned with the main magnetic field in what is referred to as the longitudinal, or Z axis. In X,Y,Z cartesian (and magnet) co-ordinates, the Z axis is also the direction of the main field lines in the scanner, while the X,Y, plane is also called the transverse plane and is perpendicular to the main magnetic field. With a strong enough pulse we can flip the magnetisation out of the longitudinal axis and into the transverse plane(this would be a 90 degree or PI/2 pulse). This will reduce the longitudinal magnetisation to zero, and instead the magnetisation is now in the “transverse” plane – the magnitude of the magnetisation in the transverse plane immediately after this excitation is equal to the magnitude of the longitudinal axis just before the excitation. After excitation, the spins start to return to equilibrium, gradually building the excess magnetisation back up, and so restoring the longitudinal magnetisation, while at the same time reducing the transverse magnetisation. 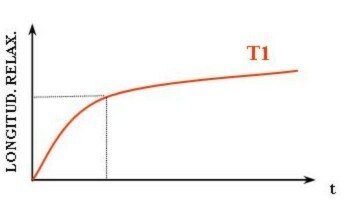 where T1 refers to the time when longitudinal magnetisation has recovered to approximately 63% or [1-(1/e)] of it’s equilibrium value. So what effect does this have on our MRS data? Well, this limits how fast we can acquire successive spectra and still retain appropriate signal to noise, as the faster we go the less signal we receive after each successive RF pulse. Unfortunately, we have an upper limit on how much signal we can get back, so while making the TR longer will gives us improved SNR, this is only true up to a point, beyond which the magnetisation has fully recovered, and so no more benefit accrues. Of course, increasing the TR also leads to an increase in overall acquisition time in MRS, especially when averaging over many excitations to give adequate SNR, hence we often compromise on TR from a T1 point of view to allow enough averages to be acquired in a reasonable amount of time. TR in MRS is therefore usually between the range of 2 – 5 secs (when using a 90 degree flip angle – smaller flip angles for the RF pulse allow shorter TR’s with less reduction in signal and there is a way to calculate the optimal flip angle for a short TR – but that will have to wait for another post). What effect if any will T1 relaxation have MRS quantification? Well, it somewhat depends on the TR. If TR is sufficiently long (about 3 x the T1 of the metabolite with the longest T1) there should be very little T1 effect on any metabolites signal, and so no real need to correct for T1 differences. If the TR is shorter then this “fully relaxed” experiment, and the metabolites of interest have a different T1 then the reference metabolite (whether Creatine, Water or another) and you are trying for some sort of absolute quantification then you really should correct for T1 differences between the metabolites. For example if your metabolite of interest has a much shorter T1 then your reference, it’s signal may be fully relaxed, while the reference’s signal has been reduced due to T1 effects, and you will over estimate how much of the metabolite is present. Conversely if the metabolite of interest’s T1 is longer then the reference’s, you will underestimate the amount of metabolite present. The T1 of most metabolites of interest, and the water in tissue is generally between 1-1.5 secs at 3T (but does vary from water to metabolites and between tissue types) – so if you are using a TR of around 4-5 secs, you can pretty much ignore T1 effects, however if you are using shorter TR’s – say the standard 2 or 3 secs – T1 effects should probably be accounted for in your metabolite calculations. (Note it may also be important to make sure T1 has not changed due to some other factor like disease processes or physiologic state, although this is rarely done in practice – but perhaps we should start?). Next post – more on T2 relaxation (hopefully it won’t take two years).